Because he is gallivanting on the other side of the planet, Mr. Covey asked me to make a guest update on his b-l-o-g. My name is William Marshall, Jr. I've got my own blog called "The Tilling of the Land" where this and other blurbs have been posted. So, I've known Chad since we were 14 or 15 years old and consider him one of my best friends. I live in the ATX. In the last couple of months, I've started a business called Austin Auditors that reviews building's energy efficiency (visit the website at www.austinauditors.com). Currently, the business is geared towards residential construction. This business was inspired in part by the City of Austin passing an ordinance mandating energy audits for homes being sold that: 1) are over 10 years old; and 2) do not meeting certain qualifications. Ultimately though, the idea is to move into doing energy audits for people who intend to stay in their home and want to make upgrades to their homes to improve its energy efficiency. Surprisingly, there are a number of home improvements that can be made that cost less than $500 and have a noticeable effect on both home comfort and the energy bill. Examples are: 1) improved insulation, 2) sealing up leaky AC ducts, and 3) improving solar shading. Moving along with the theme of energy efficiency, I am going to give you 3 tips that can have a real effect on reducing your consumption of resources and won't be monumental adjustments to your lifestyle. 1) Use compact fluorescent light bulbs, a.k.a. CFL bulbs. These things are ubiquitous nowadays and you probably have a bunch of them up already. If you haven't seen them, they look like the bulb to the right. If every household in the country used one of these guys rather than an incandescent bulbs, it would be a pollution reduction similar to taking a 1,000,000 cars off the road. The CFL bulb uses about 75% less energy than an incandescent bulb and lasts about 10 times longer. Yeah, they cost more at the store, but over the life of the bulb, you'll save over $30 when compared against the incandescent bulb. Plus you don't have to change them nearly as much. And changing a light bulb is a pain in the heiny. Don't toss out your working incandescent bulbs though. Wait until they burn out and then go buy CFL bulbs to replace them. 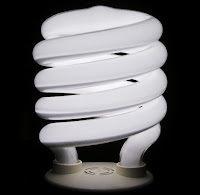 Click here for a fun site about CFL bulbs. 2) Drink less bottled water and more tap water. First off, bottled water produces 3,000,000,000 pounds of plastic waste per year, about as much waste as the combined annual waste of San Antonio and Atlanta. Second, bottled water is no more healthy than the water coming out of your tap (sometimes the bottled water is the water coming out of your tap - take a look at the fine print of some of the larger Ozarka containers and it reads something like this "Source: Houston Municipal Water Supply"). The FDA regulates bottled water and the EPA regulates tap water. However, because 70% of bottled water doesn't cross state lines the FDA can not inspect it. Furthermore, the EPA has stricter guidelines for the quality of water than the FDA does. I don't think that any water you're going to buy, whether tap or bottled, will have any negative health consequences, I just thought that the regulation was interesting. Also, you like those pearly whites that so many Americans have? Thank your municipal water supply and keeping drinking the tap water filled with all that fluoride. The Center for Disease Control identifies community water fluoridation as one of 10 great public health achievements of the 20th century. What if you don't like the taste of tap water? For instance, here in Austin, every fall and spring, the tap water tastes like algae. The solution is easy: a water filter. You can even buy one that attaches to the tap so you don't have to fill up a Brita pitcher. 3) Brush without running the water. I used to put the toothpaste on the toothbrush, turn on the faucet to wet the toothpaste, and keep the faucet running the whole time I was brushing. I didn't even think of the fact that I was actually using none of that water running down the drain. Over the last couple of years, I turn the water off once I've wet the toothpaste and I'll turn it back on at the end when I actually need the water. If you do this, you'll save close to five gallons of water per day. If the whole country did this, we'd save close to 1,500,000,000 gallons a year. Three simple ways to reduce consumption and pollution and none of these will really inconvenience you. Here's a link to list of 47 more relatively easy ways to assure that our resources and our world will stick around for more generations. Slick, I appreciate the cover. Good stuff, and best of luck to Austin Auditors. Let's connect soon to publish video on subjects of import.